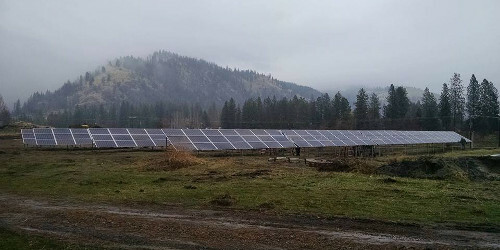 DESCRIPTION: This project was a design/build effort for a 100.8 kW-DC fixed ground mount solar PV array for the City of Kettle Falls at their WWTP site. The system is comprised of 336 Itek Energy 300 Watt modules. Power is converted by 4 SMA America 24000TL inverters and is connected to the Avista grid at 480 volts, 3 phase. The system offsets their utility usage by 132,000 kWh saving the City almost $14,000 per year.